226 historical and cultural monuments dot the landscape of one of the oldest cities in Russia, which has changed little since the 19th century. Four hundred kilometres from Moscow lies a city, where Ivan Alekseyevich Bunin, Russia’s first Nobel laureate in literature, studied and wrote his first poems. You will not find modern tourist infrastructure in Yelets. The sugar and leather plants, the distillery and the tobacco factory are all 100 years old. There are no high-speed trains to this location. However every ancient doorhandle, every house and every road looks just the way it did at the end of the 19th Century. You can travel to Yelets from Moscow on the train in 8 hours for $36.00. Trains leave from the Kursk or Paveletskiy stations. It is not simply a case of there being many monuments in Yelets, there are an unbelievable number taking into account its modest size: 226 cultural heritage sites, including 90 which are of regional and federal importance, are concentrated in an area covering little more than 65 km 2 . In the historical part of Yelets it is not just the monuments that have been preserved but the entire layout of the old city. The exact number of churches is known. 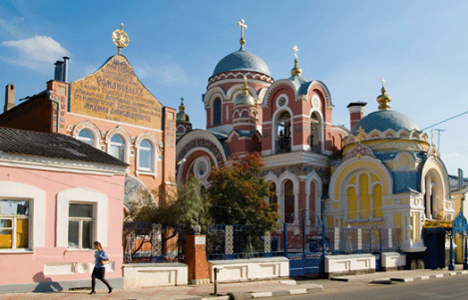 Yelets is known as the city of thirty-three churches. Although in Yelets the main Cathedral of the Ascension, designed in the Russo-Byzantine style, can be identified easily. This is the third biggest cathedral in Russia - 74 metres tall including the cross. If you are already familiar with the sights of Moscow, then you would easily find that the Cathedral of the Ascention’s features are like those of the Cathedral of Christ the Redeemer or the State Armoury. The common denominator is the architect - Konstantin Ton. The money to build the Cathedral of the Ascention was collected over a period of 75 years from the richest cities in Russia. Café Jem situated not far from the centre of the city, is suitable for a full breakfast (around $6.00). Dumplings with potatoes or cherries, one of the favourites among the locals, are still prepared here according to a traditional recipe. Incidentally this is the only place in the city that has Wifi. There are just four hotels in Yelets. The best one is the Lada . For a surcharge hotel workers can pick you up in a car. A double room costs $60.00. Other hotels such as the Parnas or the Yelets are more expensive, but surprisingly they are actually less comfortable. There are only two restaurants in Yelets (‘Olen’ on Ulitsa Sverdlov and ‘Yelets’ on Ulitsa Kommunarov) but you can eat well in either of them for $9.00. It is always bustling at weekends but you can always find a table. It is certainly worth trying the Yelets okroshka (Okroshka is a traditional soup) with kvass, a drink made from white rye. Yelets is incidentally one of the few cities in Russia where kvass made from white rye is brewed. The recipe though is so complicated that only a few city elders know it. The distillery will obligingly offer you a horseradish liqueur as an aperitif. Its unique feature is that it does not induce a hangover. Order the marshmallows made from Antonovka apples with tea, it is said that Ivan Bunin’s Grandmother developed the recipe. Brewing could also be considered one of the city’s ‘trades’ - a brewery on Ulitsa Liteynaya alongside the Konniy Most in Yelets and dating back to 1875 is still working. In the summer alongside the Sosna river, residents sit at tables with views of the river and the eastern side of the city drinking different sorts of froth with salted hors-d’ouevres, such as dried catfish. The atmosphere is open, but very cultured and calm - many people even take their children there. An excursion to the local natural history museum is considered a visitor’s card for the city. Aside from the objects from everyday 19th Century life, there are also finds from the Great Patriotic War period. These include bottles containing a flammable liquid for destroying fascist tanks. Another must-see location is the ‘Vorgolskiy cliffs’, which is in the Guinness Book of Records as the world’s smallest nature reserve. A taxi to the cliffs and back will cost around $20.00. The merchant Ivan Afanasyevich Taldykin’s estate has been preserved within the reserve. Aside from the aristocratic house, half-ruined fountains and ponds where swans swim, there is also a water mill that was built back in 1867. There are three monuments to Bunin in Yelets - one of them is school No.1 the former grammar school where he studied (Ulitsa Sovetskaya, d. 121). The school has a permanent exhibition, dedicated to the writer. There are two other statues - a stately figure of an adult Bunin in the square on Ulitsa Sverdlova and the young Bunin - as a schoolboy in the city garden. Incidentally the fountain from Bunin’s grammar school days has been preserved in the garden. The countryside around Yelets and the life of the parish of Yelets in general was for Bunin the quintessence of nostalgic Russian life. Yelets is famous for its lace. Here the tradition of weaving lace on spindles from cotton or flax thread has continued for fifty years. Before the revolution 40,000 women would sew lace here to sell. At that time the colours were natural, blue was made from cornflower and yellow from yellow-flowering plants. You can buy an average sized handmade tablecloth in Yelets for $270.